Vie Restaurant + Bar, Palazzo Versace, QLD. Holiday dining is sometimes like a beach picnic: it only takes a few gritty bits to spoil an otherwise enjoyable experience. Things like poor service, lacklustre meals and overpriced drinks are guaranteed to bring on a “tropical depression” that even a perfect summer’s day can’t fix. Especially when you’ve forked out for babysitting to enjoy some precious time alone. With just a few hours for lunch on the Gold Coast without a little one in tow, my husband wants to dine somewhere that’s a sure bet. Unfortunately he also has his heart set on a view. According to food critic John Lethlean, there’s an old rule about restaurants: the better the view, the worse the food. Based on past experience, I’m inclined to agree – but perhaps today will be different. Where: Vie Restaurant + Bar. Palazzo Versace, 94 Sea World Drive, Main Beach, Qld. Notes: Open 12pm-3pm Mon-Sat, 6pm-10pm Mon-Sun, and 10.30am-3pm Sun for brunch. Vie Bar + Restaurant at the swish five-star hotel Palazzo Versace has come highly recommended and, much to my husband’s delight, the view is superb. But what about the food? 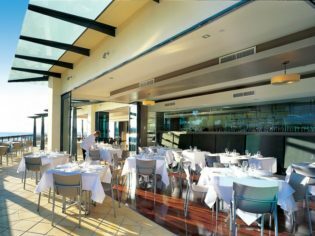 Smart linen-covered tables and a professional welcome provide a hint of things to come as we take a seat at a table for two overlooking the sparkling Gold Coast Broadwater. Mega-yachts jostle for space at the hotel’s private marina and seagulls strut along the wooden boardwalk like they own the place, displaying a sassiness worthy of Donatella Versace herself. Vie has an enviable location but it’s often the little things that elevate a good dining experience to something special. Chilled glasses of water are brought to our table immediately, and when the waiter asks how our day has been he seems genuinely interested in our reply. We’re on a tight budget for this trip, so decide on the special lunch menu which offers a set two or three courses for $39 and $45 respectively. It’s a great deal but this doesn’t stop me checking out the regular menu: it’s surprisingly well priced, with most mains under $40. We have four dishes to choose from with the special but the regular menu offers twice that and is refreshingly free of any showiness you might expect from a designer hotel. Sure, there’s a spatchcock prancing around in the mains section instead of a humble chook, but at a venue like this you would almost be disappointed if there wasn’t. Lunch is off to an impressive start with my husband’s entree of slow-roasted pork belly served with a crunchy apple salad. Not only is it visually appealing, the sweetness of the apple is the perfect foil for the richly flavoured pork. If it weren’t for my own equally impressive duck confit, I’d have serious entree envy. Tables are beginning to fill but the waiter doesn’t miss a beat, whisking away our plates and bringing back the wine list so we can choose a glass to accompany our main meal. When we ask for a recommendation, he brings a few bottles for us to try and provides helpful and informed suggestions. Each is spot on and we are delighted with our respective choices, although my husband is somewhat less thrilled when his burger arrives. It’s on a standard bread roll and he’s disappointed, insisting that since we’re dining at a five-star establishment it should be a five-star burger, not something he could make at home. Fortunately a bite of my zesty prawn linguine tossed with chilli, lemon and bright green snow peas cheers him up immediately. Dessert is a big ask at this stage – servings have been generous – but the opportunity to share a seriously good chocolate brownie is too good to pass up. Lunch concludes with duelling dessert spoons and plans for a return visit. Next time we’ll order off the regular menu and let this fashion-driven restaurant really work it, baby, work it. Note: In November (after this visit), Palazzo Versace took on a new executive chef, Geoff Haviland, previously of Jupiters Hotel and Casino, so the menu may change. “Vie restored my faith in restaurants with a view, serving thoughtfully cooked food with a focus on seasonal produce and enough pizzazz to keep things interesting. Service doesn’t miss a beat, even when the place gets busy. It’s the kind of restaurant that makes it tempting to linger.